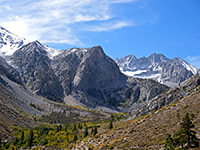 The east side of the Sierra Nevada is much steeper than the west, rising 10,000 feet above the open flatlands of Owens Valley over just a few miles, so the high elevation backcountry is generally quicker to reach. South of Mammoth Lakes there are seven paved roads that branch off US 395 and climb into the mountains, together with a number of unpaved routes, all ending at campgrounds and trailheads around 8,000 feet, from where various paths lead westwards to and beyond the Sierra crest, across land variously part of Kings Canyon National Park, Inyo National Forest and the John Muir Wilderness. One of the paved routes is the 11 mile Glacier Lodge Road, starting at Big Pine, which follows the valley of Big Pine Creek to where this splits into two branches, beneath some of the highest peaks in the Sierras including 14,242 foot North Palisade, the 4th tallest in the state. Ahead lie over a dozen glacial lakes, numerous cascades, crags, cliffs and granite outcrops, plus several glaciers, one of which (Palisade) is both the southernmost in the US and the largest in the Sierra Nevada. 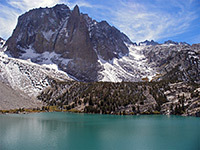 The glacier and/or the Big Pine Lakes can be visited by a fairly strenuous day hike of between 10 and 20 miles, and an elevation gain of up to 4,000 feet; unlike other east-Sierra trailheads there are no links with extended paths to the west side of the mountains, owing to the impassable summits of the Inconsolable Range, though overnight camping, off trail hiking and rock climbing are all quite popular. 28 views of the Big Pine Lakes. Big Pine is a small town of few facilities. 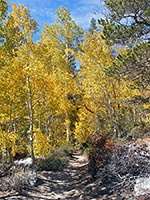 The road towards the lakes (W Crocker Street) is indicated from US 395 by an inconspicuous sign to the Big Pine Lakes Recreation Area, and starts by crossing a barren, bouldery hillside then climbing steadily alongside the creek, up a shallow valley that eventually becomes lined with the big pine trees after which the stream was named. 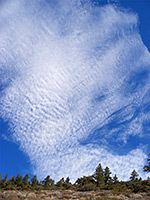 The creek is a renowned trout fishing location and has easy access from many places along the highway. The road passes a national forest campsite, an area marked 'trailhead parking' (for overnight hikers), then ends at a day-use parking area by a junction. Left is a side road to Glacier Lodge, while straight on, past a gate, are a few private residences before the road ends. No fee is charged for parking, and no permit is required for the hike, unless staying overnight in the wilderness. 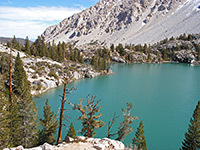 There are two trails starting here; the 5 mile path along the South Fork of Big Pine Creek reaches two lakes while climbing 2,300 feet along an open, U-shaped valley, but more interesting is the longer route along the North Fork, since this passes more varied scenery and has better views. This is the hike described below. Big Pine has a few motels, though a better selection is found further along US 395 in nearby Bishop and Lone Pine. 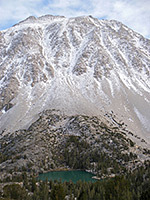 Map of the Big Pine Lakes Trail. Hikers first walk along the stream for a short distance, over a footbridge then through a patch of woodland to a junction, which gives a fine view of the South Fork canyon. Turning right, the path switchbacks up the hillside dividing the two branches of the creek and enters the overgrown lower end of the North Fork canyon, where it crosses the stream a second time and begins to climb the exposed, treeless, north side of the valley. A track runs a little way along the canyon floor, leading to a campground, though this is currently closed. 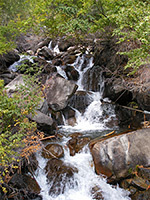 After another junction, with a less-traveled path towards the next valley northwards (Baker Creek), the trail crosses a rocky area and rejoins Big Pine Creek just above a 100 foot cascade (Second Falls), a point that marks the boundary of the John Muir Wilderness. Most of the rest of the way to the lakes is quite wooded, the valley floor covered by a mixture of pine and aspen trees. The next 2 miles of the path runs close to the stream though generally quite high above, all on the north side, ascending steadily with a few short steep sections of switchbacks though other parts are almost level. At one point the trail passes a log cabin built by actor Lon Chaney, set in a shady clearing beneath tall lodgepole pines. The next junction, 4 miles from the road, marks the start of a loop past five of the lakes, and is best hiked in the clockwise direction since the remainder of the elevation gain (1,000 feet) is done gradually and the route is fairly shady; taking the right branch first involves a quite strenuous climb up an open, south-facing hillside. So, if walking along the left fork, First Lake soon comes into view - quite a small feature, set beneath the towering, scree-covered slopes of Temple Crag and Mt Alice. Like several others the lake is filled with bright turquoise water, characteristic of glacial activity; the color results from light diffraction by suspended rock particles created by the grinding action of glaciers high above, from where the water originates. The path runs quite far from the lake though it is easy to scramble down to the water level. A short distance further is Second Lake, the largest and one of the prettiest, with a shoreline of smooth granite cliffs and boulders (see panorama). Next is Third Lake, a little different to the first two as the water is less colorful and quite shallow; in late summer the lake partly dries up to reveal mud flats at one end. 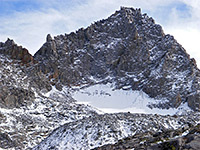 The path then climbs quite high above the west shore of the lake via a short but steep series of switchbacks, and leads on through the pine forest to a junction with a spur path to the base of Palisade Glacier. The path to the glacier is less used than the main loop, as it is quite steep, gaining over 1,000 feet in under 2 miles, and the top part is not well defined. 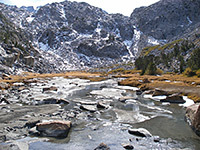 From the junction, the trail crosses a valley and a stream then begins climbing up a wooded hillside, emerging above the treeline to a small, hidden valley (Sam Mack Meadow), carpeted by thin grass and large boulders, with a small stream flowing across, fed by an unseen lake further up the mountain. The valley is ringed on 3 sides by high, rugged cliffs; the path ascends the south side to the top of a ridge then keeps climbing for another mile, veering southeast to the boulder field at the base of the glacier. Cairns mark the route for a while until the recognizable trail ends, whereupon further uphill progress is made by scrambling across the rocks. Quite a long walk is needed before the glacier comes fully into view, at the top of a long hillside that extends far below to the First, Second and Third lakes; this point is about 4,000 feet above the trailhead. The mountain slopes higher up (North Palisade) are completely barren of life, consisting just of sheer rock and deep snow. Back on the main trail, the next fork is a four-way junction. 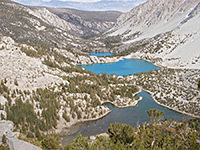 Turning left, a short descent reaches the shore of Fifth Lake (surface elevation 10,787 feet), perhaps the most impressive as it sits in a large granite bowl, enclosed on three sides by steep rocky slopes, and filled by deep, clear, blue water. If continuing straight on at the junction, the path very soon arrives at Fourth Lake, encircled by thick pine forest without the stark granite scenery of the earlier lakes. Past here are the smaller Summit Lake and Sixth Lake, where the official path ends, though Seventh Lake lies not far beyond. The final water on the loop path (Black Lake), reached by turning right at the junction, is also tree-lined and quite sheltered, though its northern edge is bordered by the smooth, more open slopes of a ridge extending east from the Inconsolable Range. Past Black Lake the path leaves the shade of the trees and begins the sharp descent back to the head of the main canyon, near First Lake.